Hi All! I'm one of the new artist on MLB Wacky Packages. I worked on sketch cards and am awaiting word as to when I can post some. I've been a WP fan since the mid seventies where I would pick them up at our local corner grocery store in Brooklyn. I was very excited to be asked to work on the set and hope to do so again as I'd love to take a crack at some of the classics! I have also worked on Star Wars, Mars Attacks and Garbage Pail Kids for Topps. More recently I did 8 paintings for Upper Deck's Firefly The Verse set. My work can be seen at the link below. Great to see you on the forum Robert! Looking forward to seeing your sketch cards! Congrats! 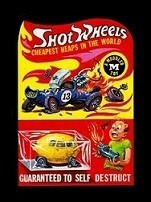 Welcome to the wonderful world of Wacky Packages! We're all hoping for another set this year so maybe you'll get a chance to draw the classics! My video for one of my Wacky Packages sketch cards for the upcoming set MLB WP! Robert, wonderful art and video! Looking forward to seeing more of your sketches! Hi All! Just wanted to mention I have 2 MLB WP's at my ebay store. Also, took a break from preparing for my show next week and relaxed a bit sketching these! Hi All! Just wanted to share my Artist Returns from WP 50th. Also wanted to show one of a few pieces I submitted to Topps to try to land some base card work. Cool! That's one of my favorites to draw! 3 left! Thanks for the support everyone! Listed this Quacker Oats return card, one of my last 2! Happy to announce my first Wacky Packages card is now available. This is exclusively an online card and available for only 24 hours! Robert, well done and congrats and your first Wacky! Thanks! It's a big thrill! I've listed the original art to my first Wacky Packages card FIDGET SPINNERS. The original art to Fidget Skinner has sold! I provided the art for the Chad Scheres concept, Hep-A Tuna. Look for more cards from me soon! Happy to show my 2 new Wacky Packages cards available on Topps.com! Listed the original art to HEP-A TUNA, acrylic on paper. Ends tonight! Came out great! Here's my original rough concept scribble. Especially like "Twin Freaks." This was the deciding factor in whether or not I purchased this set. The pendulum swung in favor. Thanks Baked Bears! And Thanks to Chad for the great idea! beautifully done, Robert! I love how it came out! Cool! Glad you like it! Not sure who you are? Do we talk on facebook? Thanks! And actually, I just uploaded the correct version. That was something that was caught before finishing the art and the topps site has the correct image! Just listed the original art to TWIN FREAKS at my ebay store!